Analog Devices announces the Power by Linear™ LTM4678 dual 25A or single 50A step-down µModule® regulator with PMBus digital interface. By stacking and exposing its two inductors on top of BGA package, the LTM4678 uses the inductors as heat sinks to transfer heat from inside, keeping the device cool. Onboard EEPROM and PMBus I²C enables a user to measure, alter and record key power parameters such as voltage, load current, temperature and sequencing. Five LTM4678s can current share at 50A each to deliver up to 250A to loads such as processors, FPGAs and ASICSs. Applications include PCIe boards, communication infrastructure, cloud computing, optical as well as medical, industrial and test and measurement devices. LTM4678The LTM4678 integrates a dc-dc controller, EEPROM, power FETs, inductors and supporting components in a 16mm x 16mm x 5.86mm BGA package. Output voltage accuracy of ±0.5% is guaranteed over line, load and temperature (-40°C to 125°C). 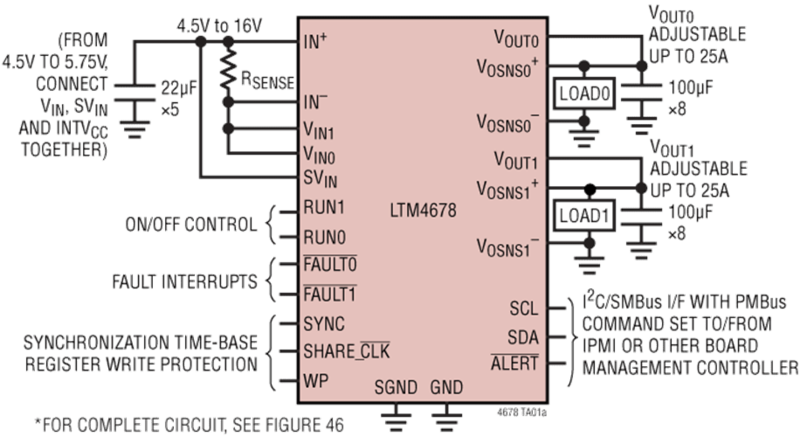 The LTM4678 operates from 4.5V to 16V input range, and the two output voltages are digitally controlled from 0.5V to 3.3V. The LTM4678 achieves 90% peak efficiency from 12VIN and 0.9VOUT at 50A. It delivers 40A at 12VIN to 0.9VOUT at 70°C ambient with 200LFM air flow. The switching frequency is 350kHz to 1MHz and can be synchronized to an external clock from 350kHz to 1MHz for noise sensitive applications. The LTM4678’s high power density and scalability make it suited for the PCB area constraints of densely populated system boards to power the low-voltage & high-current advanced digital devices. Pricing for the LTM468 starts at $47.48 in lots of 1,000. It is available for immediate delivery.